Each year, the UN’s Emissions Gap Report takes stock of where global greenhouse gas emissions are headed versus where they need to be if we are to avoid the worst climate impacts. This is our “emissions gap,” and it’s contributing to many of the escalating heat waves, droughts and extreme storms we’re seeing in communities around the world. Scientists and modelers have come together once again to measure the size of the emissions gap and explore what can be done about it. 1) The emissions gap is larger than previously estimated. To estimate the emissions gap, scientists first collect the latest information on countries’ climate commitments (known as nationally determined contributions, or NDCs) and their projected emissions pathway. They then compare this pathway with the latest models on limiting warming to 1.5°C-2°C (2.7°F-3.6°F), the Paris Agreement’s temperature goals and the limit scientists say is necessary for preventing some of the worst climate impacts. The emissions gap is large. While the NDCs will limit total global emissions in 2030 to 53-56 gigatonnes (GtCO2e), keeping warming below 2˚C requires reducing them to 40 GtCO2e on average. And to limit warming to 1.5˚C, we’d need to reduce them to 24 GtCO2e. Notably, the emissions gap has grown compared to past reports. This is in part because the new report groups pathways under three temperature scenarios (below 2˚C, below 1.8˚C and below 1.5˚C), resulting in different 2030 emissions ranges from the 2017 report. 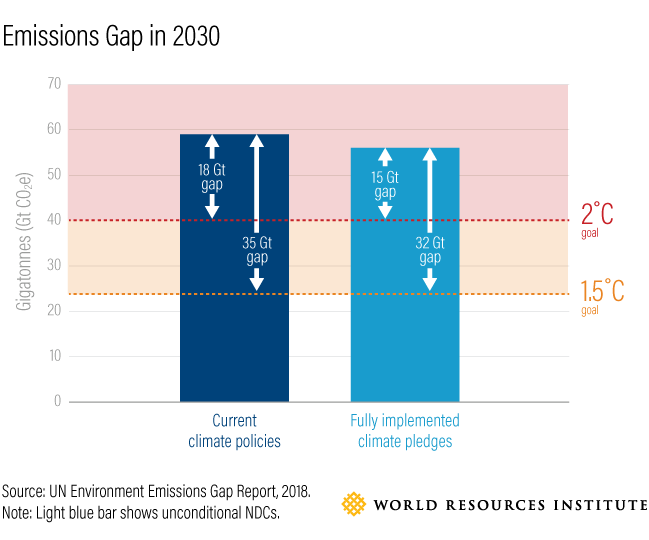 Also, the emissions gap is estimated to be larger than the previous report because there is more literature on emissions pathways consistent with the 1.5˚C and 2˚C goals. Some of the latest literature has been more cautious in relying upon large-scale carbon removal, and accordingly, greater emissions cuts are required to compensate. 2) Emissions will not peak by 2030 even if countries fully implement their climate commitments. While global emissions from fossil fuels and industrial sources flatlined from 2014 to 2016, they increased again in 2017, reaching a record high of 54 GtCO2e. The latest science suggests that peaking emissions by 2020 is critical if we are to have a good chance of limiting warming to 1.5-2˚C. However, the report finds that even if countries honor their NDCs, emissions will continue to grow not only through 2020, but through 2030. The report for the first time documents trends in individual countries’ peaking of emissions based on WRI research. While there is an encouraging trend of countries peaking their emissions – growing from 19 countries in 1990 to 49 by 2010 and 57 by 2030– it is not enough to cause a global emissions peak in the next few years. 3) Unless countries strengthen their 2030 climate commitments, we can’t limit warming to 1.5˚C, and it’s extremely unlikely we will limit warming below 2˚C. The report finds that if countries don’t strengthen their ambition and cut 2030 emissions beyond what the current NDCs require, exceeding 1.5˚C “can no longer be avoided.” And unless the emissions gap is closed by 2030, it is unlikely we will limit warming below 2˚C. To achieve the 1.5˚C target, emissions need to be slashed by more than half from today’s levels (from 54 GtCO2e in 2017 to 24 GtCO2e in 2030), or by 25 percent for 2˚C (to 40 GtCO2e in 2030). 4) Collectively, G20 countries are not yet on track to meet their climate commitments under the Paris Agreement. The report also zooms in on G20 member countries, most of which have pledged emissions-reduction targets for both 2020 and post-2020. These countries account for around three-quarters of global emissions, so their emissions trajectories drive global trends. Because several G20 members are also members of the EU, which makes a single emissions-reduction commitment, and because three G20 members did not make pledges for 2020, the report looks at a total of 13 2020 pledges and 16 post-2020 pledges. 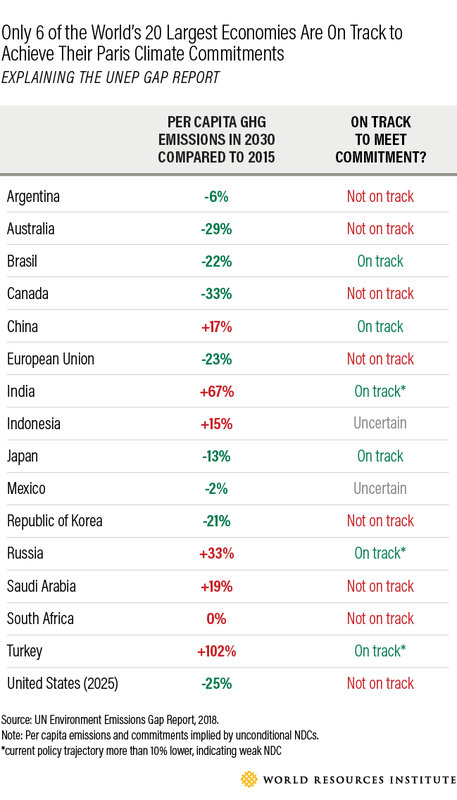 The report finds that seven countries are currently on track to achieve their 2020 pledges (Australia, Brazil, China, EU, India, Japan and Russia), two are not on track (Canada and Republic of Korea), and the remainder are subject to uncertainty (Indonesia, Mexico, South Africa and the United States). However, because some countries are expected to over-deliver on their emissions-reduction pledges, collectively, the G20 is on track to achieve their 2020 commitments. 5) Countries must step up implementation and strengthen their NDCs. Countries must increase their ambition immediately to close the emissions gap. The report outlines a few ways they can do this. For one, they can strengthen or add emissions-reduction targets, as well as sectoral targets such as those related to renewable energy. They can commit to implementing their NDCs in line with achieving net-zero emissions by 2050. The report also notes the potential to make existing policies more stringent (for example, those related to renewable energy and industrial energy efficiency), and to explore promising policies that haven’t yet been widely adopted (for example, carbon pricing and reducing fossil fuel subsidies). Calls for enhanced climate action are getting louder and louder with every release of the Emissions Gap Report. This report—which comes on the heels of the Intergovernmental Panel on Climate Change’s 1.5°C report and the U.S. National Climate Assessment—should be received with even greater urgency. The UN climate conference in Poland next week (COP24) offers the most immediate opportunity for countries to step up their ambition and strengthen their NDCs. With a narrowing window to peak emissions and a growing emissions gap, now is the time to put scientific findings into action.